UNNOFFICIAL WINTER WEATHER FORECAST SUNNY, WONDERFUL COZUMEL ISLAND! * SNOW ACCUMULATION…CERO INCHES TO NONE AT ALL. * WINDS...MILD WARM BREEZES FROM NORTHEAST. * DIFFICULT DRIVING CONDITIONS…. UNLESS THAN DUI…. NAH! PRECAUTIONARY/PREPAREDNESS ACTIONS... BRING SUNSCREEN, SUN GLASSES AND SWIMWEAR…. This winter season will be "colder" than normal, rating almost the 80° F avg. with the coldest periods in mid-December, through most of January, and in early February. Precipitation will be a .05" above normal. "Rainiest" periods will be in early mid- to late December, mid-January, and early to mid-February. As a resident I actually thank to heavens the wind becomes a little bit fresher as temperature declines specially after a particular hot summer, fall didn't help too much. Activity on the island increases as northerners runaways escape from freezing. 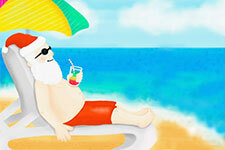 It is excellent time for seasonal shopping, sun bathing and sailing. For us here the winter is as sunny as usual with a few rainy and windy periods. If you ever coincide with a "cold" day on your arrival, a light sweater or light wind breaker will make it for the day; otherwise, if is too warm and you become in the mode for a freeze, check on my 3 tropical cocktails entry.